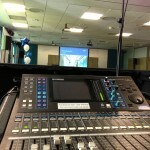 A priority AV hire and support service for local venues. Get the best AV equipment delivered to your venue on-demand. Venues use Absolute because of our professionalism, technical expertise, first class equipment and our friendly, efficient service. We’re based near Cambridge and ideally located for venues in the East of England, the Home Counties and London. Some venues outsource all their AV requirements to us, while others just use us to supplement their own in house equipment. Whichever route you chose, we’ll guarantee a special venues discount and provide on site advice and technical guidance.